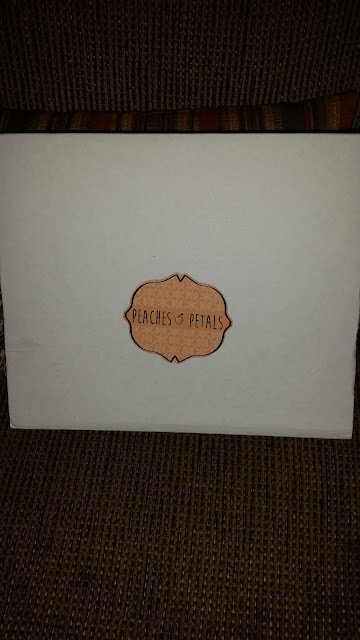 Thank you to Peaches & Petals for providing me with product, free of charge, in exchange for my honest review. All thoughts and opinions shared are my own. After the holidays, I often find myself dealing with the winter blues. I certainly have enough happening in my life right now to keep me on my toes, but between being stuck indoors due to the cold temperatures and those super gray days, I could certainly use a little something to brighten up these long winter months. Receiving a special treat in the mail definitely does the trick! Peaches and Petals is a fun monthly subscription box that sends out the latest trends in women's fashion, and gifts to love! Peaches and Petals is a member based monthly subscription service that hand-curates each box with items that exemplify the woman who’s not afraid of adventure. She’s open-minded, free-spirited, and loves relentlessly. Each box is delivered monthly. 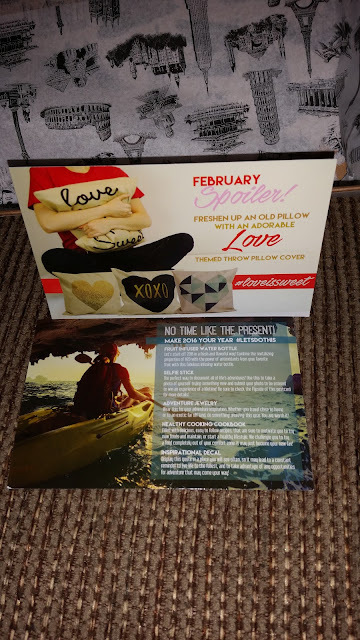 A sweet surprise, delivered right to my door- the January Peaches & Petals Box! 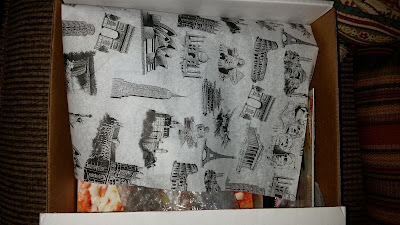 As I slid the box open, I noticed the adorable tissue paper, wrapping up the January goodies. 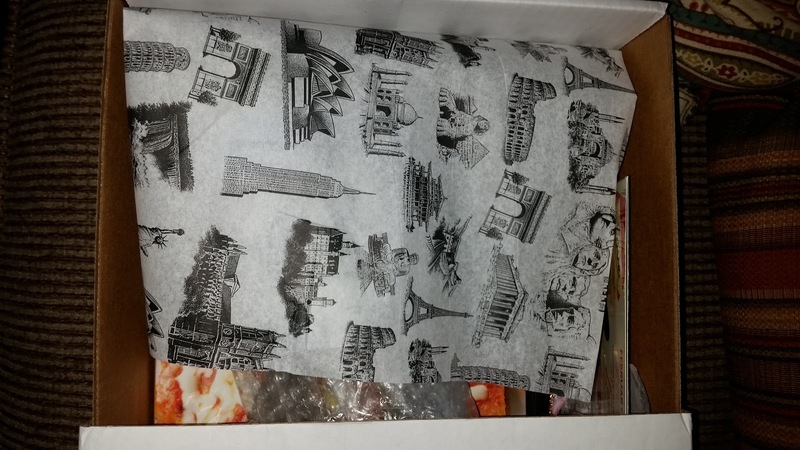 The paper was black and white, but depicted famous international monuments and landmarks- several of these I would like to see in person in my lifetime! Opening up my monthly Peaches & Petals Box is my 'me time.' Sure, I'm not alone when I'm opening it, but for just a few moments, it seems as though the world stops, and all is quiet and calm. It might sound silly, but to a busy mom, this is sacred time! 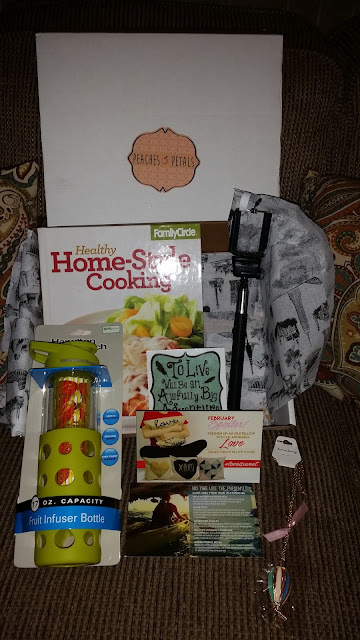 The January Peaches & Petals Adventure Box included all of these fabulous products and surprises! This Hamilton Beach Water Bottle is a great item for any gal! This water bottle holds 17 oz. and is BPA free. 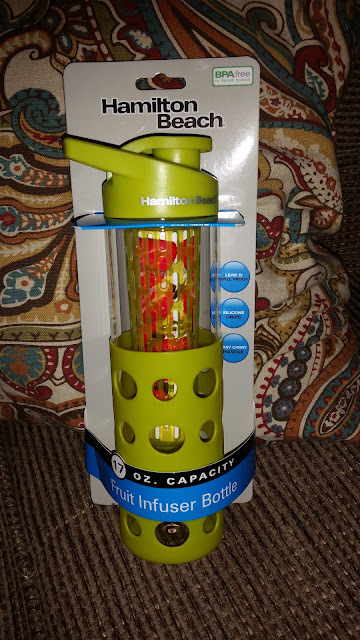 I love the bright green wrapping around the bottle, and also love that it is a fruit infuser bottle! It's perfect for me, because I feel like I have an unquenchable thirst lately (thank you, Baby S!). I am trying to drink more water, but to be honest, I am not a fan of drinking water. It's so bland, and I have trouble downing glass after glass all day long. With the ability to place fruit directly into the water bottle, I can add instant flavor to my water. I add fresh lemon, lime, and orange from time to time for a nice, refreshing twist on traditional bottled water. The other thing that I love and appreciate about this water bottle, is that it eliminates waste. We try to cut down on waste as much as possible in our house. We recycle everything we're allowed to (so much so that we really need another huge recycling bin), and we stopped buying bottled water a long time ago. We bought a filtering system, and we bottle our own water in reusable water bottles. I am glad to have this new water bottle in my collection! The January P & P Box also included a selfie stick! So, this is an item that I saw lots of friends posting about on social media this Christmas. 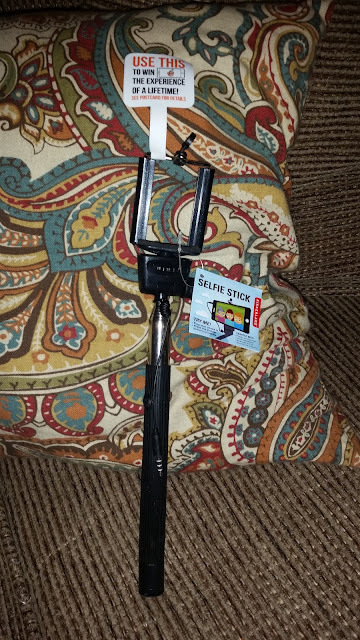 So many people were gifted selfie sticks, and I thought it was so silly. The truth is, for my job, I am sometimes stuck without someone to take my picture, and wind up trying to do it myself- poorly, I might add. With the selfie stick, I can hold the camera far enough away to get a good, clear shot! This 'silly' invention is actually a lifesaver, and I am pretty excited to own one now! 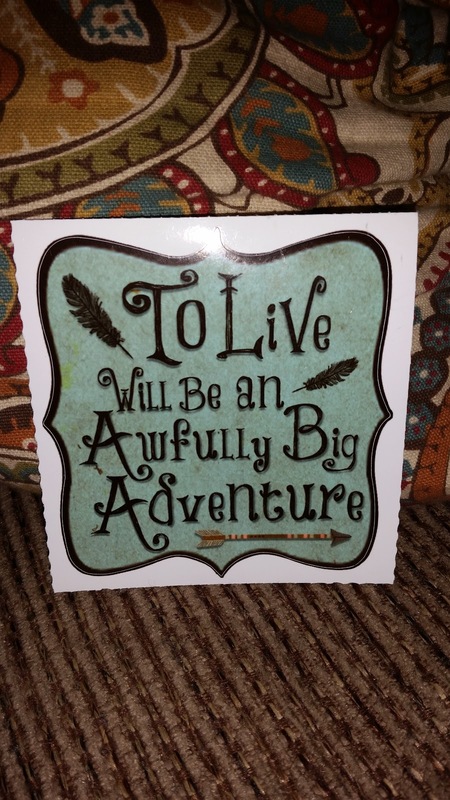 I also received this inspiring sticker! I love adorable stickers. I am a scrapbooker (or at least, I used to be) and love collecting stickers that I can use in my albums. This sticker is going to be saved for our next family road trip adventure. I can't wait to scrap with it! This cute little gem was a neat surprise in the January box, as well. 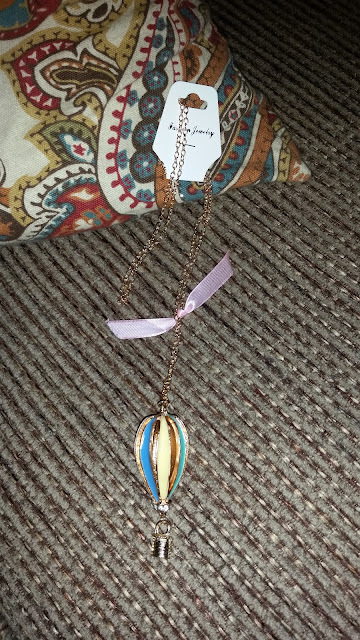 I enjoy unique jewelry, and this sweet necklace was hiding in the January Peaches & Petals Box. The necklace features a large, colorful hot air balloon on a golden colored chain, with a light pink ribbon. It's not something that I would typically wear, but for special occasions, I would definitely put this on. There is a hot air balloon festival in the county next to ours every year, and I am hoping that we can make it there this spring. If we do get to go, I will surely be wearing this cute themed necklace! The icing on the cake of the January Box- a Healthy Home-Style Cooking cookbook from Family Circle. I love cookbooks! I rely on them to find and try unique recipes. I get so bore eating the same old thing all the time, and this book has a fantastic collection of simple, healthy recipes. Hubby and I are trying to eat healthier (which is hard for me right now, as I want to eat everything in sight! 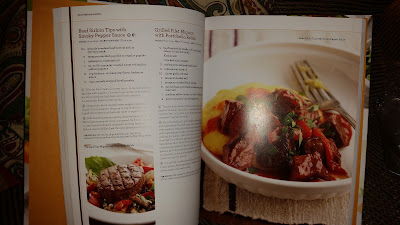 ), and this cookbook has some great recipes for us to try! 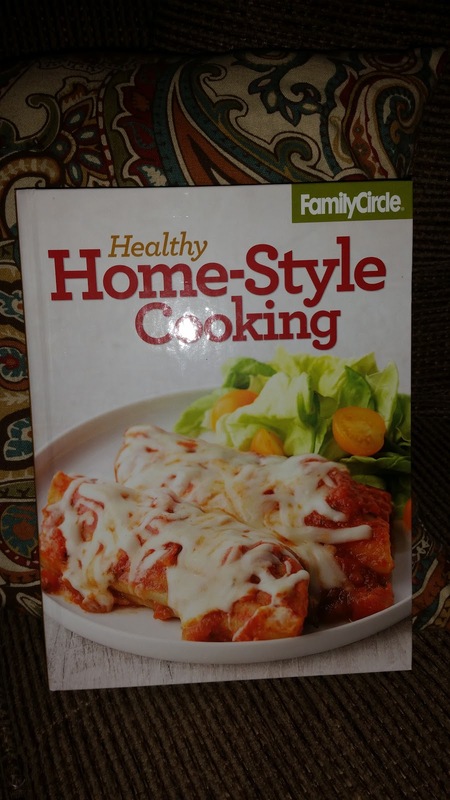 From healthy grilled meats to yummy and light pastas, there are lots of great recipes in this book that we can't wait to try! 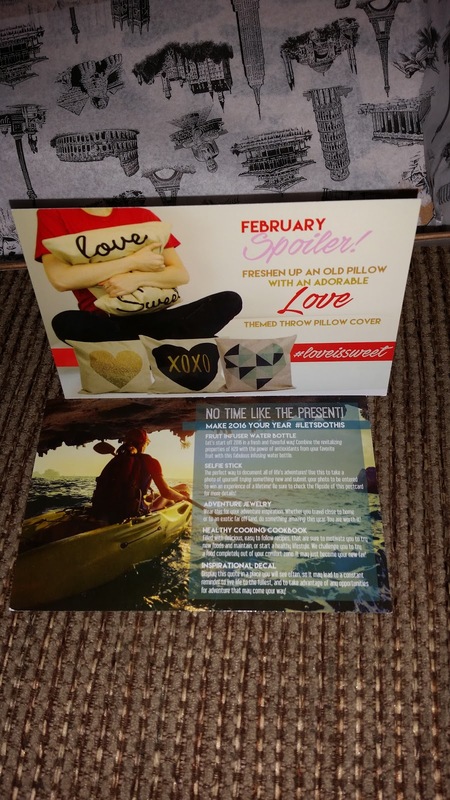 The January box also included a sneak peek at what's coming up in the February box. I'll give you a hint, it's love themed! I thought that this was a really fun box to explore, and enjoyed being transported out of my little mommy bubble for a while. These are all useful products which I will be able to enjoy beyond just this month. Each month's box will vary with different items all to tickle your senses. P & P loves hand-selecting items in beauty and fashion accessories. Items could be trendy accessories and jewelry like scarves, hats, earrings, necklaces, bracelets, rings, watches, new beauty products like dry shampoos, eye makeup remover, shades of nail polish, eyeshadow and blush, pampering products like mud masks, skin restoring gels/creams, and who knows, we could be really adventurous the next month! Each box will contain 3-5 items and some months they may feel super excited and throw in an additional item! You never know quite what you'll receive in a Peaches and Petals Monthly Box- that's what makes this subscription so much fun! Subscribe and divvy up the contents to share with friends, subscribe as a gift, or keep the box for yourself- whatever floats your boat! Peaches and Petals would make an awesome gift! Head on over to Peaches and Petals to subscribe to this fabulous monthly subscription box. It's just $14.99/mo and shipping is free. Connect with Peaches and Petals on Facebook, Twitter, YouTube, and Instagram. 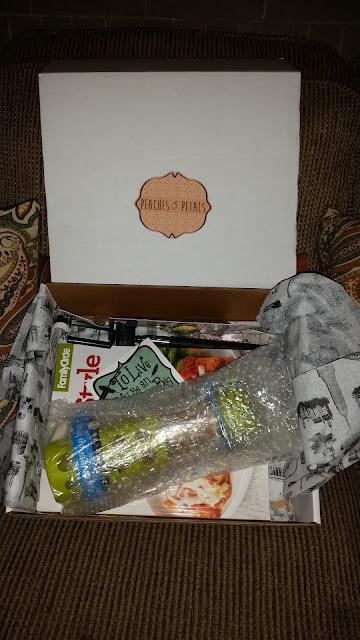 Special thanks to Peaches and Petals for allowing me to check out and share about their sweet subscription service.